Destiny 2 has been largely under the microscope since its release; offering less content than its predecessor and gameplay systems that are often at odds with one another. The remaining community has been very vocal about the lack of endgame content present in the current build of the game and after Bungie was caught lying about how much XP is earned once you hit level 20, well, they needed some good press and reception to come from this latest expansion pack, which is too bad since Curse of Osiris is a small band-aid to a wound so large it's gushing blood. This first expansion, The Curse of Osiris, was released far too soon after the launch of Destiny 2 to really tackle much of what is presently unsatisfying in the current state of the game, so it's safe to say that it was never going to 'fix' many of the game's current problems. What wasn't known, however; was just how short and hollow this expansion pack was going to be. The campaign itself should take you no longer than 2-3 hours solo and even shorter should you roll with a full fireteam, should you still have friends who log in regularly. The rest of the content can mostly be explored within a day or so and the leftover systems meant to introduce the grind for gear are mediocre at best. There is also the issue of it blocking off existing content to those not willing to pony up another $30, but we will get into that a bit later. There are two strikes added to this new content pack and both of them are simply a retooled story mission with a new narrative. These Strikes are the exact same mission complete with the exact same encounter at the end, making it the laziest effort I've seen in the history of this franchise. The three Adventures that unlock after beating the story are actually drastically more superior than the strikes themselves and actually feature some interesting mechanics and moments that need to be a staple of the series from now on. There is only one single Patrol activity to speak of that is actually pretty fun should you have a few other players with you, but I think with the release of a full expansion that a single Patrol activity is not going to cut it. The campaign finally introduces us to Osiris, a character who is placed deep within the lore of the series and while it's very cool to see him in action and interact with him, the way in which the game ends is very anti-climatic and feels like a wasted opportunity for the character and what it means to have him back in this world. The new play space, Mercury, is a very small playground that features three Adventure missions and one single Lost Sector. This is by far the smallest location offered so far in the series, but there is one small catch to its size. At the top of a set of stairs is a glowing triangle door, this is the entrance to the Infinite Forest. This location is essentially a tunnel leading to a randomly generated staging area that then leads you to your destination. This path changes each time you enter it and the locations on the other side of this path vary from gorgeous fields simulating what Mercury looked like in the past, to various other locations that look your standard old Destiny fare. This door to the Infinite Forest only opens up via missions or Adventures instead of offering up its use for patrols or something else to let players take advantage of how cool it actually could be. The randomness of the Infinite Forest is a very cool idea but sadly, all locations tend to blur together because it uses one single design aesthetic to have randomized. 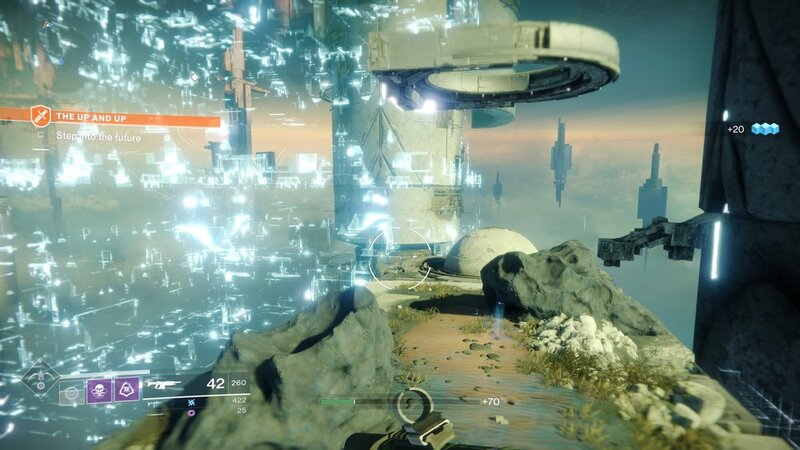 Had this Forest consisted of several styles and offered up different gameplay mechanics, then Bungie could have had a very interesting idea here. There is one Adventure that also presents a very cool concept for a patrol scenario or even a whole mode unto itself. The Adventure titled "Bug in the System" has Guardians protecting a data point from waves of Hive. It is a hectic and incredibly fun activity that should it become its own mode, well, I'd be all over that for sure. As you enter Mercury, you are able to enter the new player space, a spot that is meant to be similar in function to the Farm or the Tower. 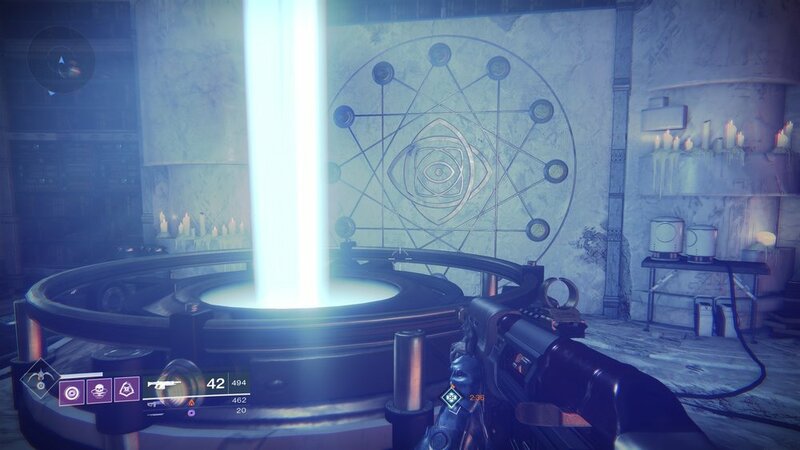 This area is smaller than the hanger in the Tower and offers up nothing more than one NPC to talk to and a short book puzzle to unlock a chest. This NPC is Brother Vance and once you have completed each of the three Adventures on Mercury, he will offer you tasks called Lost Propechies. Each of the Prophecies rewards you with one of the new weapons indicated by symbols featured in a circular design on a wall. You'll need to gather materials and then bring them back to the Forge to then construct this new weapon. While there is one weapon not indicated via a Prophecy, you merely need to trigger all ten Prophecies to unlock a special quest to obtain this rare shotgun. While this expansion pack doesn't feature a full-on Raid, it does feature the Raid Lair, a smaller, more bite-sized Raid that is actually well-designed with its jumping puzzles and boss mechanics. Despite its shorter length, I actually preferred it over the current Raid since it felt more like a Destiny 1 Raid, which I easily prefer more than what Bungie has offered up with Destiny 2. Ever since Bungie changed their PVP to 4 on 4 instead of the 6 on 6 that Destiny 1 gave us, players have been mostly disappointed in what Destiny 2 PVP currently offers. As it stands, no current weapon feels powerful enough to become the meta for how players engage each other and the over-powered Prometheus Lens Exotic introduced in this expansion has seen a temporary nerf to make it all but useless. There are three maps added to the Curse of Osiris; two if you play on Xbox One or PC as PlayStation once again gets bonus content due to their business dealings with Activision. These new maps are rather fun and offer many different paths for players to engage each other. Currently, players who have not purchased this expansion are locked out of Prestige difficulty activities like the Raid and the Nightfall, as these have been leveled up to the 330 max light level for this expansion. 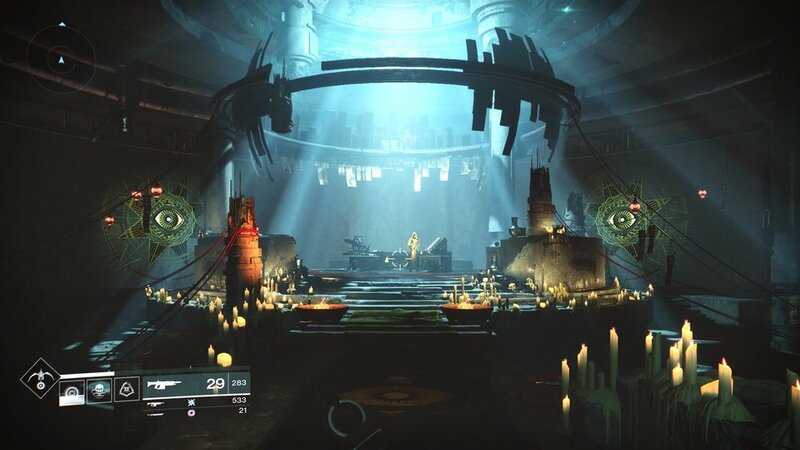 Bungie has announced they plan on rolling back the light level on the Raid but will be keeping the Prestige Nightfall at the max light level featured in the Curse of Orisis. I'm sure that even more changes will come in the future, but that is the current state of the game right now. Destiny 2 excelled in its audio and it is no different here. The expansion features multiple new tracks with some solid music in many of the new missions. Osiris himself has a female voice for his ghost and frankly, it is handled in such a way where you almost get Cortana vibes out of how several of her lines are delivered and written. Resident Evil and The Mummy film star Oded Fehr, voices Osiris himself and it is such a good choice as his tone and manner fit the world of Destiny better than most voices chosen for this series thus far. Your own ghost doesn't really have many lines and the fact your own character is still mute makes several encounters incredibly awkward. The Curse of Osiris is a gorgeous expansion when it comes to visuals. There are several locations that are nothing short of breathtaking and it's very clear that the art department at Bungie is at the top of their game. Several of the new guns and armor sets are really impressive and even a few fan favorites from Destiny 1 are back with some new perks and stats added to them. With the release of a new expansion, there are also several balance updates and refreshes to certain systems. As these are not technically part of the expansion itself and more of a standard update to all versions of the game, I won't be diving into them with this review. That being said, there is still more planned updates to occur on the 12th, and several more to drop in the new year. Despite some brief enjoyable content, It is safe to say that the Curse of Osiris is a vast disappointment. The campaign does have some fantastic moments and the final boss encounter is one of my favorite in the series. The strikes are an absolute waste of content as is Mercury itself as it is far too small and offers almost next to nothing to keep you busy after you've already completed it once. Apart from the Lost Prophecy weapons, you can burn through this expansion in a day and at $30, that is incredibly unsatisfying. Destiny 2 is in dire need of new systems, more endgame content, and a reason to keep players invested. If the upcoming second expansion doesn't in some ways address the glaring problems this title has, then Destiny 2 is doomed to fail. destiny 2: curse of osIris dlc WAS PURCHASED BY THE REVIEWER. ALL SCREENSHOTS WERE TAKEN ON XBOX ONE X.